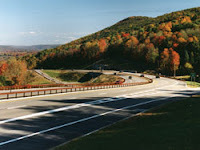 the nytpicker: NYT Runs Sidebar On Taconic Parkway Today. That's Three Weeks After Taconic Accident Kills 8. Especially cynical since the discussion about the roadway's safety was quashed by how the driver was drunk and stoned, a fact much covered since then. Three weeks after the Kennedy assassination, did we write of the danger of convertibles? And then there's the problem that the Taconic is actually safer, at least according to one set of statistics. there have been two additional accidents of drivers going in wrong direction on Taconic, most recently last week. what's going on?